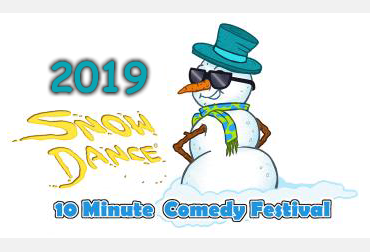 RACINE, WISCONSIN, FEBRUARY 24, 2019: Over Our Head Players concluded the 2019 Snowdance® 10 Minute Comedy Festival on Sunday by presenting the audience favorite Best in Snow prizes. Over the five week sold-out Snowdance run, each attendee played judge via their votes. The Best in Snow winning entry was Balls Alive! by Brian Wallace of Los Angeles, California. Second place went to Strike a Match by Tony Targan from West Bloomfield, Michigan. Third place went to The Disagreeable Dinner by Mark Osborne, of New York, New York. After the final Snowdance performance Sunday, the audience voted for their favorites, just as audiences at each of the previous 24 performances had done. The final show’s tally was added to the votes from throughout the run. Then, the Snowdance ensemble came together for the Closing Ceremonies. As is tradition, the ceremonial Dance of the Salmon highlighted the Closing Ceremonies. Although the honor of dancing with the salmon is not given to just any clown, Droppo (Michael Retzlaff) made a guest appearance to lead the waltz, joined by back up pretty salmon dancer Kristin Althoff. Then, the ceremonial Snowdance snow cone was sealed away for next year’s competition, and the company gathered around balloting supervisor Anna Clementi, who had the winning results sealed in a mayonnaise jar. As Anna declared the winners, Snowdance ensemble members accepting the awards on behalf of the playwrights. Kristin Althoff, director of The Disagreeable Dinner, accepted third place. Melissa Zeien accepted second place for Strike a Match. Finally, A. J. Laird, an actor from Balls Alive!, took first place on the podium. The $500 first place Best in Snow award went to Brian Wallace of Los Angeles, California for Balls Alive! – an air brand breaks up when one member starts “seeing” a new woman. Second place went to Tony Targan from West Bloomfield, Michigan, for Strike a Match which featured four singles looking to “strike a match” at a speed dating event. Third place was awarded to Mark Osborne, of New York, New York for The Disagreeable Dinner about a Mexican dinner that did not agree with Steve’s insides. Second place received $200, and the third place award was $100. Snowdance was produced by an ensemble. 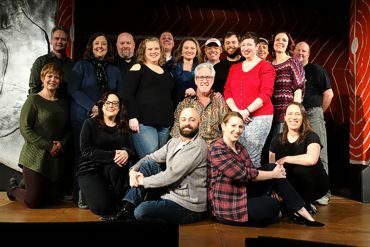 The acting and directing ensemble featured John Adams, Kristin Althoff, Elizabeth Bitner, Diane Carlson, Paula Ann Czechowicz, Nicholas Hoyt, A.J. Laird, Anne Mollerskov, Michael Retzlaff, Ron Schulz, Rich Smith, and Melissa Zeien. The additional production staff also included John Adams, Janine Anderson, Diane Carlson, Skip Carlson, Anna Clementi, Rebecca Eisel, Carol Gavigan, Chad Heinzelman, Preston Hill, Carol Horton, Sally Laird, Mona Lewis, Christopher Larson, Ryan Loberger, Paul Reese, Joan Roehre, Ron Schulz, Veronica Smith, Rich Smith, Teri Stanley, and Emily Sweetman. The Snowdance Comedy Festival was sponsored by Minuteman Press. Over Our Head Players will close their 27th season in spring with Leaving Iowa, by Spike Manton and Tim Clue. 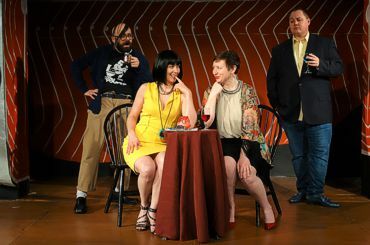 A warm comedy, Leaving Iowa is a toast to the parents of the “Greatest Generation” and a roast of their dedication to the family road trip, with performances March 29 – April 14. 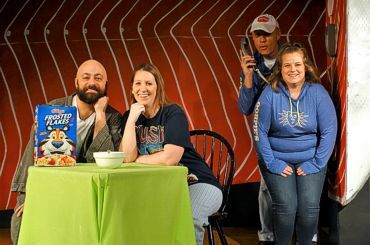 OOHPs has been operating the Sixth Street Theatre in Downtown Racine since 1999. In March, Racine native Rachel McPhee will present Dead Shot Mary at Sixth Street Theatre. Dead Shot Mary, by Robert K. Benson, presents the phenomenal true story of Mary Shanley, one of the NYPD’s first female detectives. Tickets for both of these productions are available on this web site or by calling the box office at (262) 632-6802. The 2019 Best in Snow Winner: "Balls Alive!" by Brian Wallace, Los Angeles, California. 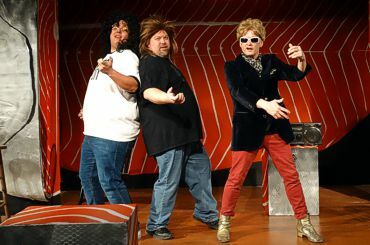 Featuring Michael Retzlaff (Jason), A. J. Laird (Jon), John Adams (Bobby). Directed by Ron Schulz. The end of a great air band. Second place went to "Strike a Match" by Tony Targan, West Bloomfield, Michigan. Featuring Nichols Hoyt (Leonard), Anne Mollerskov (Julia), Melissa Zeien (Karen), Michael Retzlaff (Ken). Directed by Paula Ann Czechowicz and Rich Smith. The perils of speed dating. Third place went to "The Disagreeable Dinner" by Mark Osborne, New York, New York. Featuring Nichols Hoyt (Steve), Kristin Althoff (Susanne), Rich Smith (Voice of Juan), Elizabeth Bitner (Voice of Consuelo). Directed by Kristin Althoff. A Mexican dinner did not agree with Steve. © Over Our Head Players, Inc.